I had been back at the pond trying a few casts, and Hubs was up by the house cutting wood for our outdoor wood burner. Tag was, as always, 'helping' his dad. No, I do not take the dogs back to the pond with me when I'm going fishing. Why? Well, because I have three Border Collies, two of whom love the water (ESPECIALLY Tag). I swear, if we had a swimming pool, we'd need a swimming pool safety fence not because they can't swim, but in order to keep them outta the pool. They immediately run for the water! 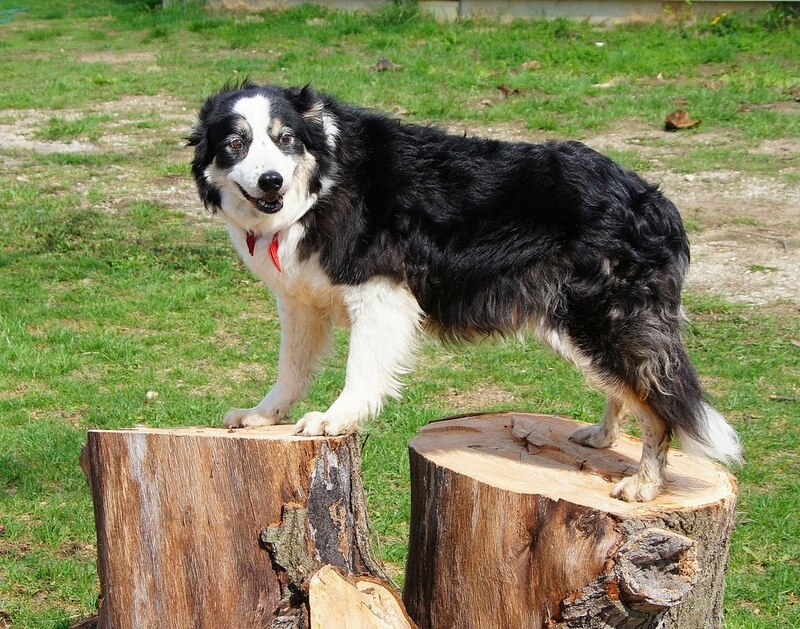 So, when I walked back up from fishing, Tag decided to pose on some of the big logs for me. Why? Because his Daddy asked him to, of course. Tag's purpose in life, other than to herd farm equipment, is to please his Dad! I did have one . He did get somekind of lung infection from something he ate here on the farm or breathed in. I lost him a few years ago. Ewww, who wants fishy smelling collies? I'd leave 'em home too! I'm not playing today but I did want to drop by to wish CC a very happy 4th anniversary!!! Such a playful and gorgeous boy. Great shot. Tag is a good dog to obey his dad! Neat photo! *throws a tractor* Tag! Fetch! Tag is a beautiful, great pose and photo. Have a great weekend, Misty! What a handsome boy he is! Great pose. Handsome and obedient :) Our Lab had her own little kiddie pool. Great model! He's a handsome fellow. He is such a fun looking guy! Great shot. We had a Border Collie when I was a child. Her name was Ketty and she always looked after me. But she seems th have been much smaller then your dog. He even looks quite friendly in that photo. He looks like he's playing king of the mountain. Great shot of handsome Tag. Oh, what a fabulous dog! So handsome! He sure is a handsome fella and a lot more obedient than mine.